In a previous article, we have ever compared Sony a6000 to Canon EOS M3. This time, however, we are going to discuss about the differences between Sony a6000 and Canon EOS M. The concern is, Canon EOS M is quite more affordable and budget-friendlier than Sony a6000. As the effect, some people are wondering if they can get Canon EOS M as a viable alternative of Sony a6000. 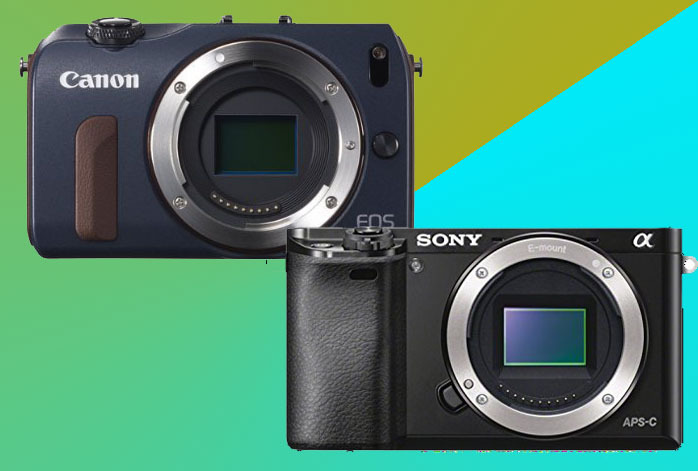 Are you having the same question about these two mirrorless digital cameras? Well, read on to find the answer. We can immediately see some distinctions from the exterior looks of the two products. They are designed quite differently from each other. Canon EOS M is quite smaller and lighter than Sony a6000, making it somehow more compact and portable. Canon EOS M also features a touchscreen control. At the opposite, Sony a6000 is slightly bulkier and heavier, featuring dial controls. Some people may prefer the touchscreen for the neat appearance, while some others prefer the dial controls for an easier and quicker access. One important factor to consider in choosing for the right mirrorless digital camera is certainly the image quality. While Canon EOS M relies on an 18MP APS-C CMOS sensor with DIGIC 5 image processor, Sony a6000 boasts a 24MP APS-C CMOS sensor. Sony a6000 can effortlessly generate much more sharpness and details into the images. Furthermore, Sony a6000 also breathes more solid and accurate colors and dynamic range to the images. Sony a6000’s output is more realistic and vivid. Given that Sony a6000 also boasts a smarter and faster AF system with a lot more focus points, Canon EOS M can hardly able to match Sony a6000. One thing that may hinder you when using Canon EOS M is the shutter lag time. Canon EOS M nearly takes a second (0.74 seconds to be exact) after each shot before being ready for another shot. Its buffer size is also relatively small, though still usable for purposes that do not require speed. Its buffer can take up to 6 RAW shots or 13 JPEG shots before taking a break. The continuous shooting speed is also not impressing, barely 4.3 fps. On the other hand, Sony a6000 boasts 0.15 seconds of shutter lag time, bigger buffer size, and 11 fps photo burst. Last but not least, Sony a6000 also comes with Wi-Fi and NFC. So, is Canon EOS M a viable alternative of Sony a6000? Well, Canon EOS M is certainly not as strong. The AF system struggles in tough lighting conditions and macro photography. Therefore, we recommend you to stick with Sony a6000.